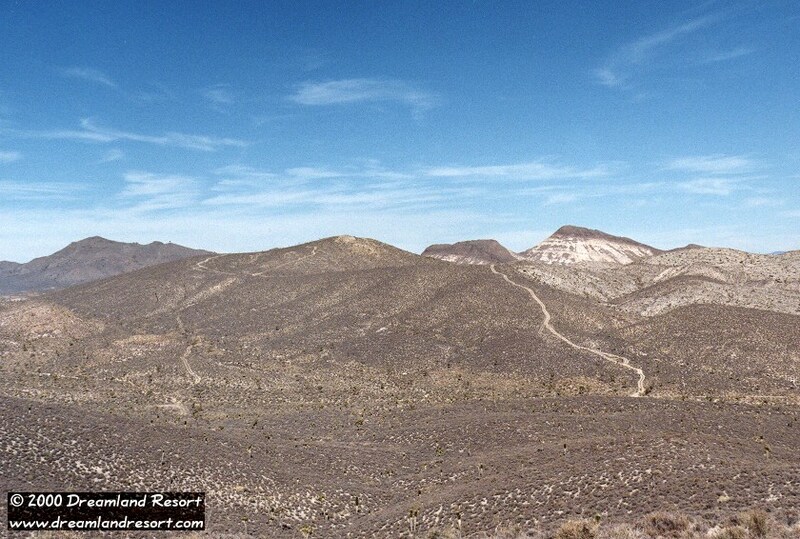 Before the land withdrawal in 1995 you were able to see the Groom Lake Base from only about 12 miles away, from Freedom Ridge and White Sides. These two view spots were taken by the base in 1995, and are no longer accessible to the public. Now you have to hike up to Tikaboo Peak, 26 miles from the base, to see all the good stuff that isn't there. But even before 1995 the cammos tried to block access to Freedom Ridge. They set up an illegal roadblock in a canyon about a mile before the turnoff to Freedom Ridge. They simply blew off some of the rocks of the canyon walls, which very conveniently fell on the road. They arranged them in a nice straight line across the road, to make sure that it is completely blocked, and voila, there was your instant "natural" roadblock. This place has since become known as Roadblock Canyon, and before the land withdrawal some folks have built a dirt ramp that allows driving over it with a high-clearance vehicle. Which these days does not get you much further, since you will run into the new border after only about 1/3 mile. Please do not attempt to cross the roadblock with your vehicle. It is very easy to get hung up, and you are about 20 miles away from the highway here. Instead, park your vehicle off the road and hike to the signs. Be extremely careful not to cross the border by accident. There is really nothing much to see here any more, and since it is very easy to get in trouble here I will not give exact directions. There are a lot more interesting and easier accessible sites to see around the base. 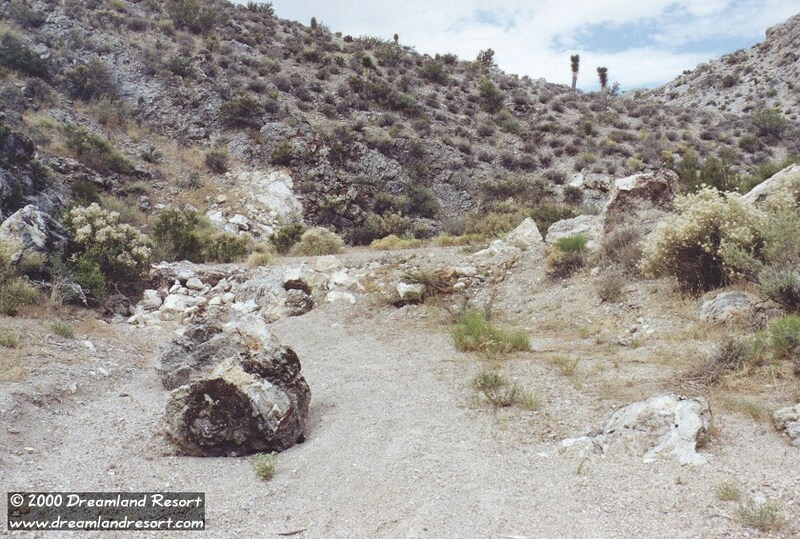 The old roadblock at the entrance to Roadblock Canyon. 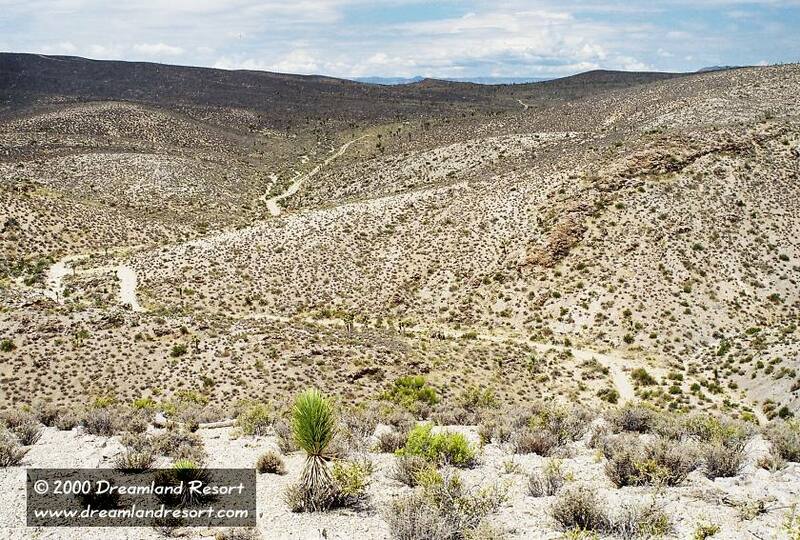 The "rockslide" conveniently blocks the road, which leads up to Freedom Ridge, one of the prime viewpoints for Area 51. 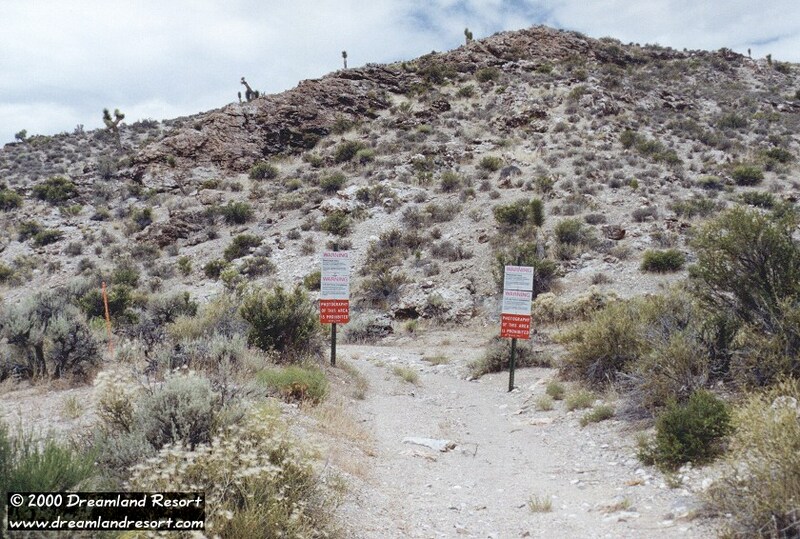 The roadblock was created by base security in an attempt to keep people from going up to Freedom Ridge, but was soon bypassed by a dirt ramp that allowed high-clearance vehicles to drive across. Photo taken 7/9/1999. About 1/3 mile past the roadblock, inside the canyon is the new border, which was created when Freedom Ridge and White Sides were taken by the base in 1995. Signs on both sides of the road and orange posts, but no fence. If you get here, be extremely careful, the border line in this area is very confusing, and it is very easy to accidentally cross it. Photo taken 7/9/1999. The road as it continues inside the new part of the restricted area towards the base. The slope on the right is the south end of Freedom Ridge. The access road leads up from the main road. Area 51 lies in the valley behind the ridge in the center of the picture. See the white dot on the road, below and to the left of the single peak in the center? That is a cammo jeep, sitting by the old signs that still mark the spot where the old border crossed the road. The road leading up the ridge which blocks the view to the base is another popular cammo hangout. Photo taken 7/9/1999. Both former viewpoints in one picture: Freedom Ridge in the foreground and White Sides behind it on the right. The base is on the left, and the road from the picture above runs across the picture from this angle. We are looking up the Freedom Ridge access road, and you can see the loop on top, from where you have a clear view of the base. The smaller dirt road on the left was inside the old border, and the cammos used it to "sneak up" on curious visitors. Photo taken 11/11/1999.